Many paper size standards and conventions have existed at different times and in different countries. Today there is one widespread international ISO standard (including A4, B3, C4, etc.) and a localised standard used in North America (including letter, legal, ledger, etc.). The paper sizes affect writing paper, stationery, cards, and some printed documents. The standards also have related sizes for envelopes. The international paper size standard, ISO 216, is based on the German DIN 476 standard for paper sizes. ISO paper sizes are all based on a single aspect ratio of square root of 2, or approximately 1:1.4142. The base A0 size of paper is defined to have an area of one m². With the given aspect ratio of square root of two, this corresponds to a piece of paper which its longer side is one metre multiplied by the square root of the square root (that is, the fourth root) of two and the shorter side being the inverse of this value. Rounded to millimetres the A0 paper size is 841 by 1,189 millimetres (33.1 × 46.8 in). 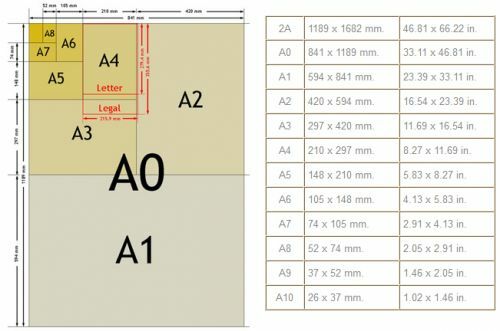 Successive paper sizes in the series A1, A2, A3, and so forth, are defined by halving the preceding paper size along the larger dimension. 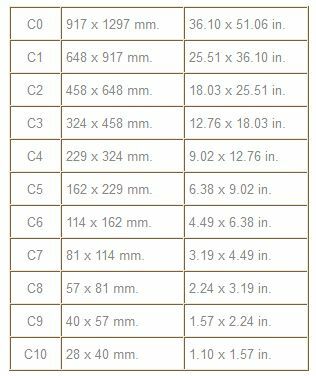 The most frequently used paper size is A4 (210 × 297 mm). In addition to the A series, there is a less common B series. The area of B series sheets is the geometric mean of successive A series sheets. 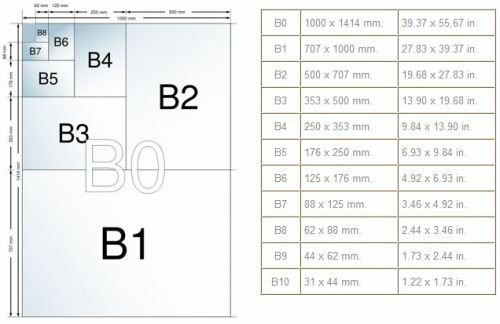 So, B1 is between A0 and A1 in size, with an area of 0.707 m². As a result, B0 is 1 metre wide, and other sizes in the B series are a half, a quarter or further fractions of a metre wide. While less common in office use, it is used for a variety of special situations. Many posters use B-series paper or a close approximation, such as 50 cm×70 cm; B5 is a relatively common choice for books. The B series is also used for envelopes and passports. The C series is used only for envelopes and is defined in ISO 269. The area of C series sheets is the geometric mean of the areas of the A and B series sheets of the same number; for instance, the area of a C4 sheet is the geometric mean of the areas of an A4 sheet and a B4 sheet. This means that C4 is slightly larger than A4, and B4 slightly larger than C4. The practical usage of this is that a letter written on A4 paper fits inside a C4 envelope, and a C4 envelope fits inside a B4 envelope.